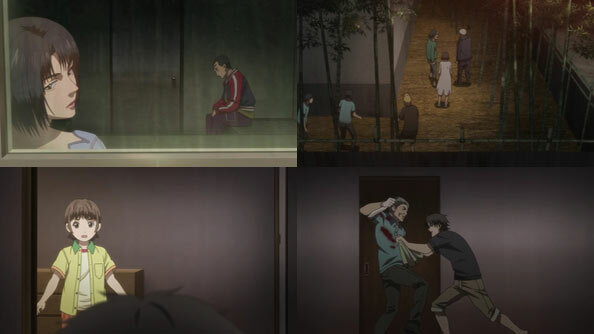 “All you can do is what you can do, one thing at a time.” That’s the advice Hayashida-sensei gives Rei after another consultation about Hina’s predicament. Hayashida is as outraged by the attitude of Hina’s homeroom teacher—and as rearin’ to go give her a piece of his mind—as Rei, but neither of them can. 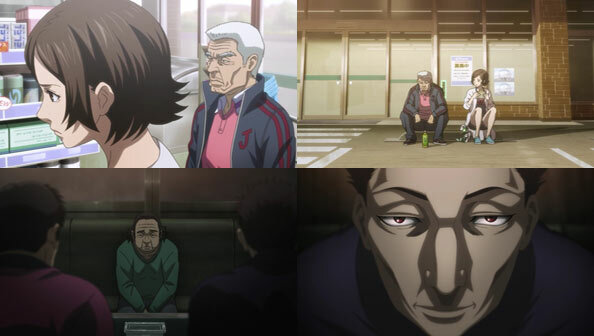 Hayashida is a total stranger in the matter, while Rei took a path of isolation that won’t work for Hina…though I maintain that his plan of “at least have lots of cash sitting around” isn’t a bad one, though Hayashida is right that the Kawamotos would not easily accept it. 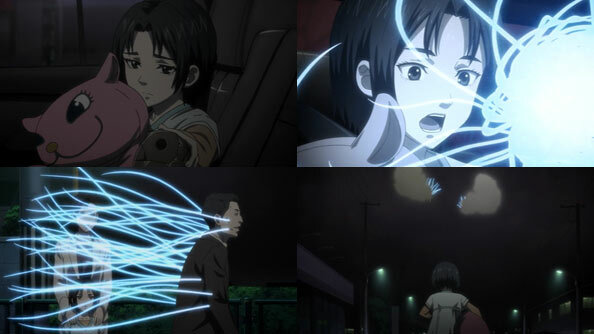 Akari’s emotionless tale of their father’s whereabouts—he left them to start another family—was suitably heartbreaking. But so is the sudden news that his self-appointed rival Nikaidou lost the semifinals in the Newcomer Tournament, and is apparently now too ill to leave his home. Rei wants answers, so Shimada provides them—by telling Rei the story of how his master took on one more disciple after him: a tiny, round, sickly boy. Shimada dismissed him, as most did, as a pampered rich boy, but in him raged a burning passion the equal of any shogi player, even if he lacked adequate skill to match. 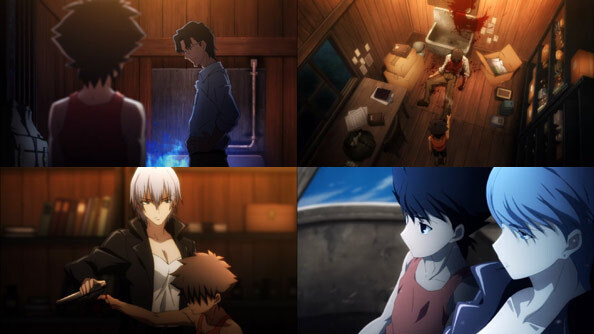 Due to his (undisclosed, incurable) illness, Nikaidou couldn’t have a normal childhood any more than Rei could with the loss of his family and turbulent years with his stepsiblings. But back then, as now, Nikaidou only ever “did what he could do, one thing at a time,” staying in every match until he had nothing left. He was doing it because he could, but also so Rei could have a worthy rival to keep him on his toes. Now that Rei knows how weak Nikaidou is, one could be forgiven for thinking he’d go easy on him next time. But Rei understands what devoting oneself to shogi means, even if his path to the game was much much different. That understanding demands he show Nikaidou no mercy next time. And hopefully there’ll be a next time. 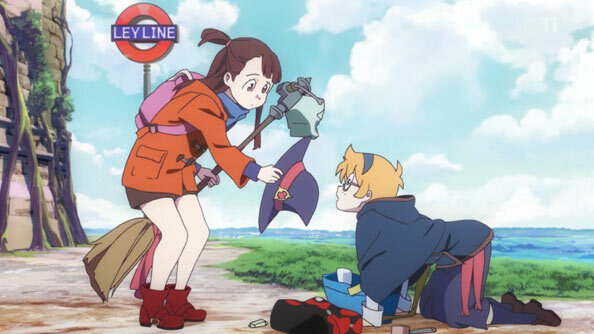 The heart-pounding and heartwarming fun of LWA continues as its third episode is all about broom flight, or, for the first two-thirds of it, about how totally unable to fly Akko is. No matter how hard she “focuses” or how loudly she says the magic words, gravity won’t release her from the ground. She’s wanted to fly her whole life, and proudly bears the scars that prove it. As Akko fails and fails again, you can feel her frustration mounting, especially once she learns there’s to be a broom relay and Diana is the favorite to win. There’s the sense Akko is right on the cusp of a magical breakthrough, but just needs something to go her way and complement her boundless passion. After some last-ditch “training” that seems more designed to amuse Sucy than help Akko, the relay begins, and thanks to some magical trickery and research on the competition, Sucy is able to get Lotte out to a sizable lead that she then extends. Then it’s Akko’s turn, and Sucy lends her a potion that turns her broom into a ribbiting pogo stick. As Diana says with disgust, it ain’t pretty. Then, the feral broom in the magical items cafe Akko wanted to try out rejects the one who stole/purchased it (Amanda) and takes an interest in Akko. It makes her fight tooth and nail to stay on, and tries to throw her off many times, but Akko won’t let go, and it takes her on a magical ride through homes, under oceans, and through the sky at jetliner speeds. 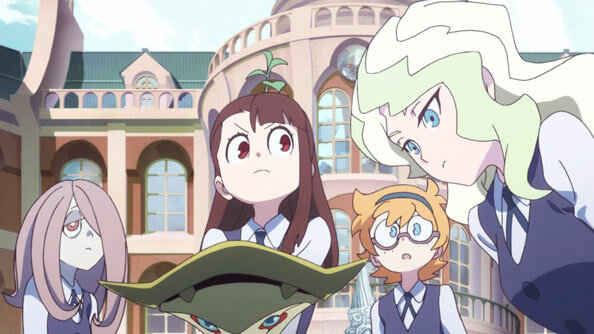 LWA truly brings the fun and the wonder, whether it’s the sweeping sights of Akko’s detour or her veritable galaxy of inventive acrobatics and contortions. She doesn’t win – the broom handles break off and the broom turns into a bird and flies off – but she comes in a close second, once again commanding Diana’s grudging respect. As Diana says, Akko’s got passion. I daresay she’s brimming with moxie as well. Will it be enough? Ursula looks at her younger self in the trophy case, and maybe sees Akko going down a similar path. And she seems worried. 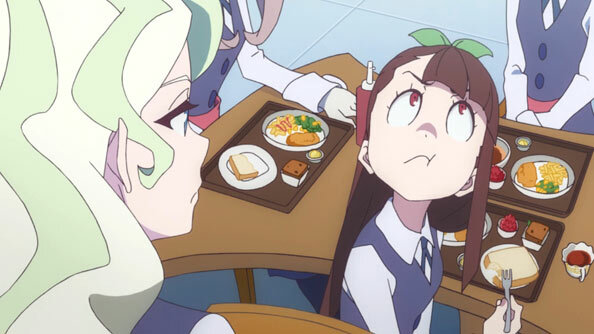 But I wouldn’t rule out Akko continuing to surprise everyone—even her apparently disillusioned idol. 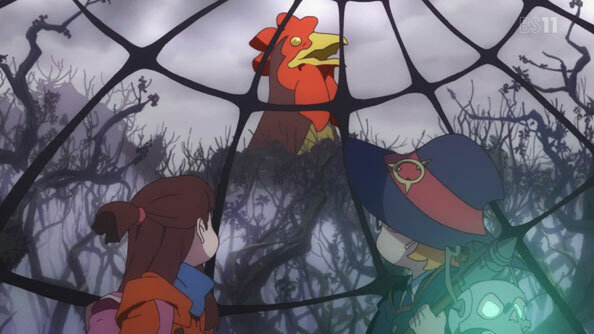 LWA’s first episode promises Akko has what it takes to be a witch, and possibly a good one, by summoning the power to save her new friends from a wild Cockatrice and transport everyone safely to school. But not so fast…the next morning Akko can’t seem to get the Shiny Rod to do anything, and her first day of exciting classes turn out to be nothing but lecture after interminable lecture. 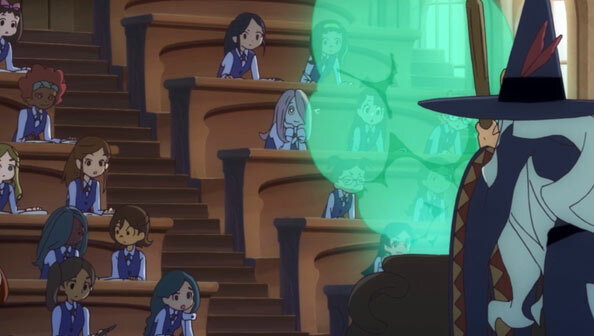 Whether it’s a student using a small spell to keep potions away, to Sucy stealthily turning Akko’s hair into a plant, I love this kind of magic school minutiae. One person who stands out in every class is Diana Cavendish (of the 1,500-year-old Cavendish Family), who is believed to be the finest which of her generation, and the best to ever attend Luna Nova. I’m thinking Granger ability in a Malfoy package. Yet while she’s undeniably talented, and a little aloof, she doesn’t come off as your typical stuck-up aristocratic jerk who needlessly harasses our heroine Akko. Indeed, she seems to follow the ideal standard of noblesse oblige: she’s polite and respectful, but isn’t afraid to tell what she believes to be a harsh truth: that Shiny Chariot isn’t all Akko makes her out to be. Diana also indulges Akko’s desire to show her what Chariot’s Shiny Rod can do, and waits patiently for Akko to do…something, anything. But the Shiny Rod just won’t cooperate. 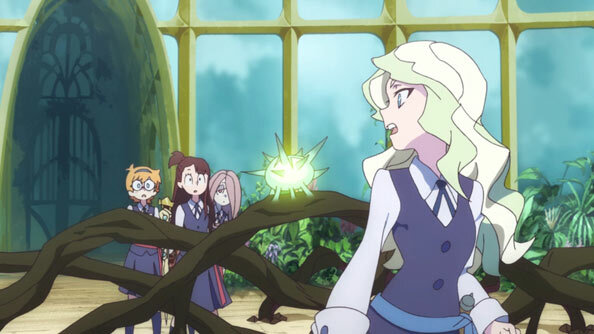 When it’s Diana’s turn to demonstrate her power, she does so, doing what Akko tried to do and make the statue in the courtyard not only move (in an awesomely trippy sequence that may have only happened in poor Akko’s head) but pluck that plant from Akko’s head, restoring her ponytail. What with all the talk of Shiny Chariot once being a pretty popular name in “performance witch” circles, no one’s seen nor heard from her in ten years…because she’s most likely assumed the identity of Professor Ursula, whom it was hinted last week could be Akko’s muse. Considering her interest in Akko, I wouldn’t be surprised if Ursula/Chariot is trying to groom a replacement from the shadows, even bequeathing to Akko the Shiny Rod that served her so well…at least for a time. That being said, if Diana and her admirers represent the average opinion on the matter, it would seem that entertaining masses of muggles isn’t the most respected profession in the magical world. Still, there’s every indication the magical political spectrum is as wide and diverse as the non-magical one, with Diana Cavendish insisting (and being able to back up) that “magic is cultivated through the accumulation of lasting traditions and assiduous research,” basically the opposite of Shiny Chariot’s “A believing heart is your magic” credo. It’s almost science vs. faith! Akko’s faith in Chariot and the power of the Rod summoned the magic necessary to save her, Sucy and Lotte. Then again, there’s a science to her “assiduous research” of the Chariot collector cards and their effects. Her “lasting tradition” is the tradition of fandom. This week, that lovingly-cultivated and maintained fandom comes in handy, just as her believing heart did so last week. Diana shows she’s still young and not perfect when in her hubris she believes she can singlehandedly restore the old Jennifer Memorial Tree none of the professors can diagnose. She releases a powerful spell that indeed revitalizes the tree, but also strange glowing orbs she assumes are parasites to be exterminated. But they’re not pests; they’re chrysalises containing Papilliodya, which emerge only once every 120 years (or only a dozen times in the entire history of the Cavendish Family). 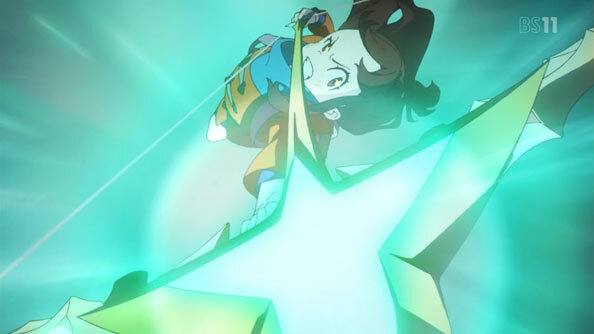 Diana is ready to take out every one, but Akko stops her, even taking a direct hit that stuns but does not disable her. Akko casts the spell on the trading card, and thousands of magic butterflies are able to take flight for the five continents, resulting in a stunning display that inspires hope in all who behold them. When the professors see the restored tree, both they and Diana’s toadies shower her with praise, but Diana, again displaying signs of a healthy conscience, tries to insist it wasn’t her who made it happen, running off before giving Akko the credit. I like to think Diana saw a teensy bit of promise in, and respect for, Akko, despite their very different magical ideologies. As for LWA, it continues to impress with its eye-grabbing visuals, lean, nimble character design, surprisingly complex characters, lush action, and optimistic outlook – the very definition of must-watch. P.S. 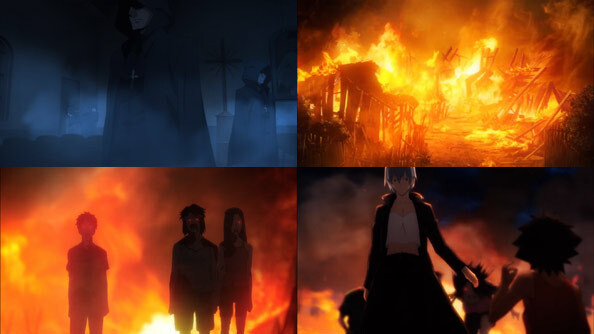 We already knew the OP was great, as we saw it as the ED last week. Now we see the proper ED, and it’s great too. Both feature memorable pieces of music that don’t try too hard. 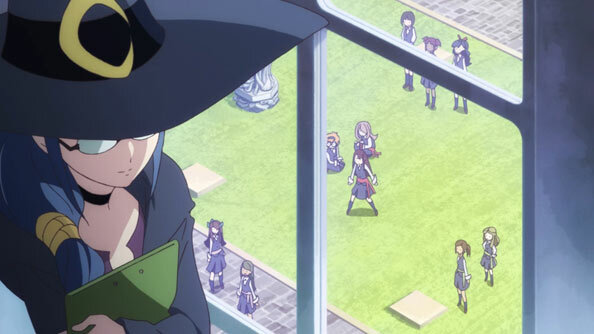 The Jist: After being inspired from a young age to become a witch like her idol Chariot, Kagari Atsuko, AKA Akko, enrolls at the magical Luna Nova Academy, meeting a standoffish fellow classmate, Sucy, along the way. Her journey hits a snag when she learns she needs a broom, and when she attempts to share a ride with a second classmate, Lotte, they end up going out of control in the ley lines landing in the forbidden Arcturus forest. 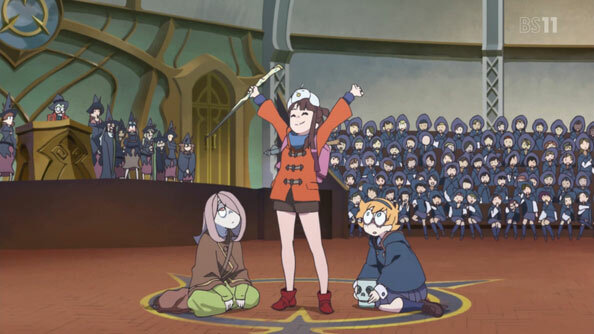 Sucy uses them as bait so she can pluck a cockatrice feather, and in the ensuing chase, a determined Akko summons Chariot’s “Shiny Rod” and uses it to speed Sucy, Lotte, and herself to Luna Nova in the middle of orientation. They later learn they’ll be roommates at the school. 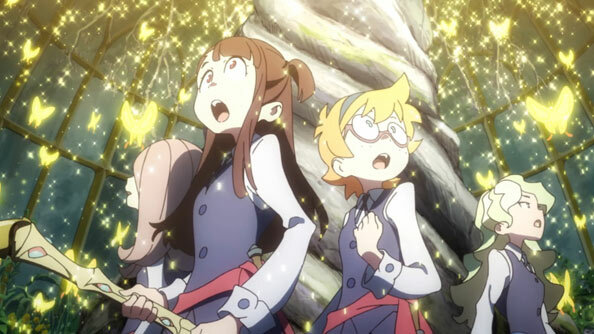 You Should Definitely Watch LWA because it’s gorgeous and immensely fun, and its first episode is a wonderful introduction both to Akko, the kind of tough, perservering girl she is, and the magical, whimsical world she’s gotten herself into. The show wastes no time subverting any expectations Akko’s trip to orientation will go smoothly. Since this is my first exposure to the franchise, what it reminded me most of was, of course, Harry Potter, especially the stuck-up witches complaining about their academy admitting students who aren’t of pure blood (i.e. muggle-born). 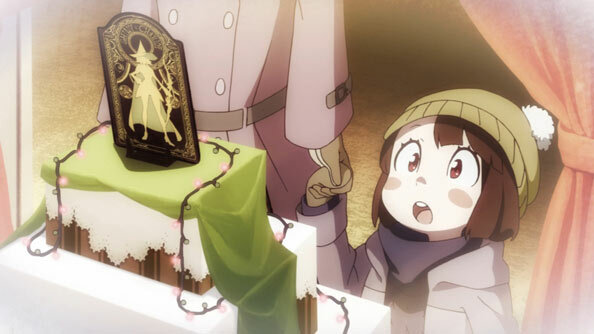 Akko is a perfect heroine, not too perfect, but has all the intangibles one needs to go far, including an unswerving faith that she’ll be able to fulfill her dreams. It also reminds me, in a good way, of one of my favorite films, Kiki’s Delivery Service, if Kiki started out less well-versed in magic. As far as why you shouldn’t watch, well…what the heck is wrong with you, you monster?!? Seriously though, if you’re not a fan of Trigger’s Gainax-esque animation style (similar to Kill la Kill, but a lot less abstract and more focused here) or character design, you may find this a hard watch. You may also just not into magical school anime, though the title should be a pretty good warning for such people to keep away. And of course, if you are very well-versed in LWA lore, perhaps you just don’t like the cut of this new adaptation’s jib. Again, I wouldn’t know. The Verdict: LWA is my first, and possibly only, truly Must Watch premiere of Winter 2017, joining Zane with his fine rakugo sequel. LWA sports heaps of heart without getting cheesy, exciting thrills without getting gory, and an overarching buoyant warmth and optimism that is lacking in so much anime these days, and thankfully isn’t undone in the closing moments by someone’s evil smirk or a Dun-dun-DUNNN. It’s also less “kiddy” looking than My Hero Academia, and miles better-looking and sounding. Most of all, I’m looking forward to episode two more than anything else on TV, as Akko & Co. officially begin their training after an immensely entertaining introduction. If any of this sounds good, then take my recommendation and watch at once. 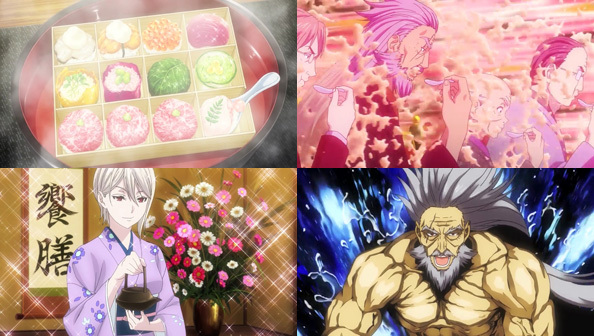 CRY HAVOC, AND LET SLIP THE DOGS OF FOOD WARS. That’s right, the ridumptuousness (ridiculous sumptuousness) continues right where it left off: the final round of eight/quarterfinals. 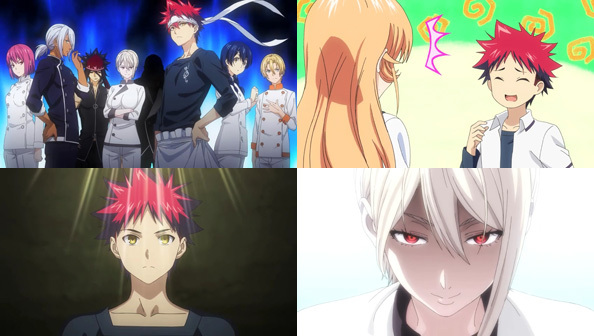 And as if knowing how much we’ve missed it, the second season gives us a Souma vs. Alice showdown in its entirety: beginning, middle, and end. Before the match, we see how hard it is for Erina not to get worked up and start yelling at Souma (who only responds with lighthearted friendliness as usual). Alice is good at “playing” this “game” with Souma, keeping her contempt and condescension below her cool surface. This makes Alice an interesting adversary, because she’s so nice on the surface, but with that killer instinct just below it. But make no mistake: Alice is on it in this match, and fuly intends to blow the judges and Souma away. Not only does she finish first, but she delivers a veritable jewlery box of amazing, delicate, yet powerful temari sushi flavors. Everyone is bowled over, as she intended; even her grandfather goes bare-chested, which is a sure sign you know some god frikkin’ food has just been served. But while the other judges and crowd are intimidated and disheartened by Alice’s culinary might, Souma just keeps grinding, not the slightest bit unfazed. When he reveals his dish, locked tightly in a multi-layer lunch pail/tiffin, to be an evolution of nori bento, Alice has never actually heard of it; perhaps too beneath her greatness? But at this point, she remains friendly towards Souma, though some say she’s just being condescending because she’s so certain of winning. Akasaki Chinatsu excels in giving Alice just the right tones. But as usual, Souma combines his time-tested techniques with fresh ideas from the most random places to shock and delight the judges over and over again. Alice’s dazzling sushi jewels were on display for all to see, but Souma’s is likened to a treasure box, and its inherent thrill of discovery. His secret weapon in the rice layer seemed at first like he was simply copying one of Alice’s molecular techniques, but it turns out making liquids into solid beads is something he’s done for years, after trying a kid’s candy label that tought him how to do it. Furthermore, he was reminded of the technique while cooking for kids, i.e. working for more than just himself. 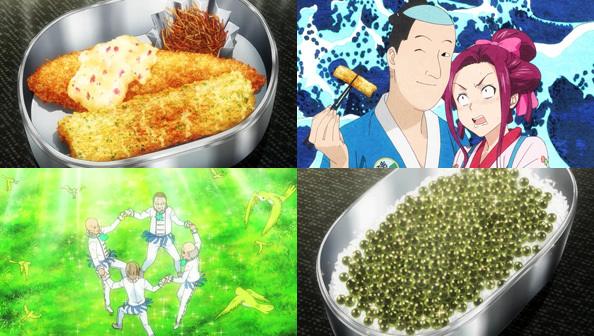 Alice could easily throw Souma’s apparent “Heart over Science” strategy in his face with a scoff, deeming flavor the most important thing, but her grandfather admonishes her: this isn’t about whose dish reminded whom of their childhood. 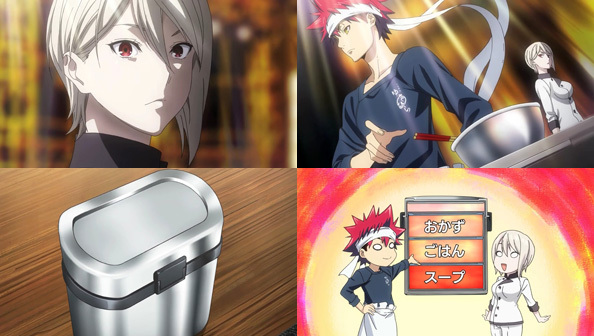 It’s about bento, and Souma’s take on that theme—doing things you could only do with bento—surpassed what could just as easily have been a dish in a sushi battle. So Alice, who has likely long forgotten what losing is, loses in a HUGE upset. And Souma’s bento’s time-travelling powers send her back to cold Scandanavia where she worked furiously to gain techniques Erina lacked so that Erina wouldn’t be the only young Nakiri people would mention in conversation. Alice has already achieved that, and taken her place on a near-equal level with her cousin. So it was high time she was brought back down to earth from her cold space station of centrifuges and liquid nitrogen, and brought back into the warmth. Hopefully she’ll take this fair-and-square defeat in stride and not go all Erina on Souma! Next up: Megumi vs. Ryou. So glad this show is back. Now I wait…until Restaurant Week later this month! As Arthur summons Oz (that’s right: the Wizard of Oz…oh my) along with Loki, not necessarily for their aid but to at least bear witness to the impending discovery of the Divine Gate, the show takes a closer look at the cheerful, energetic Midori, who not surprisingly is dealing with demons just like Aoto, which affects her focus and performance in a sparring exercise, and may prove more of a crippling liability as the quest to find the gate heats up. We haven’t even been formally introduced to three of the six kids in the core group, but as Akane talks with them, one makes clear that Midori’s intense belief in the Gate, or something related to it, could be hampering her development, like an anchor holding back a boat (not the most flattering metaphor, I’ll admit). As Aoto is initiated into the academy, he still declines warm food and has trouble putting into words why exactly he’s there (as opposed to how he came to be there). But it’s a brief outburst by Midori about “being number one” that shifts Akane’s attention to her later. 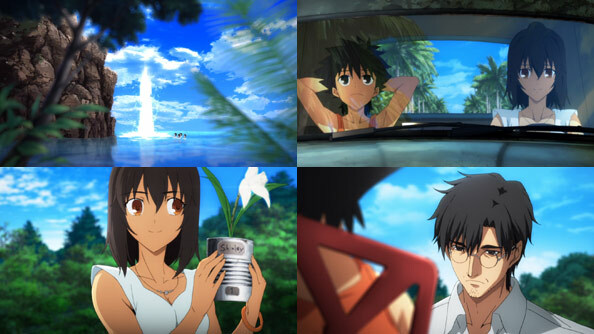 Midori decides to open up Akane, telling him about her friendship with Elena, someone who only wanted one friend: her. When Midori, a far more outgoing girl, inevitably made other friends at school, it poisoned the bond between them, culminating in an ultimatum from Elena that Midori simply could not accept. This was a decent, no-nonsense execution of the Obsessive Friend theme. Midori fails to make up with Elena, who rather than attend the summer festival as they always do, heads off to find the Divine Gate on her own. 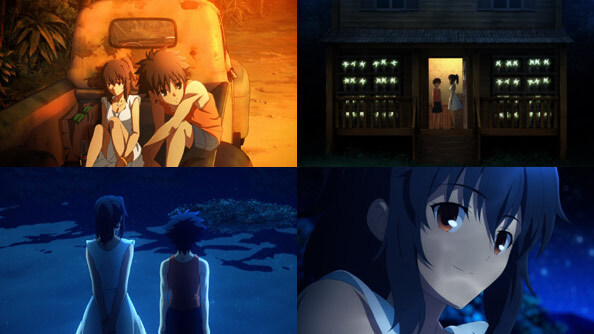 Once Midori hears of a girl disappearing in the mountains, she rushes to a police-filled scene, and actually sees the massive gate looming over the mountain. Ever since that strange, vivid experience, Midori has not only believed in the gate, but believed Elena was already there, waiting for her. She wants Elena to still be alive, but she also wants to repair the bond she broke by rejecting her ultimatum (which wasn’t an unreasonable move, but obviously came at a stiff price). 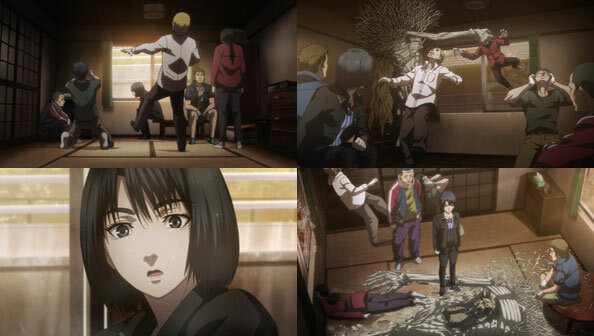 Aoto hears a little of the story, and it probably shows him that he’s not the only one with issues, but unlike her, he’s also got a little boy in his head telling him how messed up he is all the time. Akane and Midori can see him talking to someone they can’t see, and it worries Midori. She does some digging online (on a computer with a keyboard that seems way too loud and disruptive for a library), but as soon as she accesses Aoto’s files, a red “Restricted Access” wall goes up, stopping her in her tracks and making her and Akane wonder what the heck Aoto did, or what was done to him. Another episode that efficiently fleshes out one more character, Midori, without solving all her problems, but making us understand her better. I imagine the show will eventually do this with Akane and the other three prominent kids in the group, parallel to Arthur and the Round Table’s more abstract machinations. However, I won’t be around to see it, because the mystery of the gate just isn’t doing anything for me, and there’s no indication the revelations (if they ever come, as we’re likely to be strung along for some time beforehand) will be any less half-baked than the characterization of iconic characters like Loki and Oz. So I’m making a discreet exit now; no hard feelings. Divine Gate’s second episode delves further into both Aoto and Akane’s troubled (if very different) pasts, and there’s some okay character work going on as Aoto discovers a way to start moving forward. But it paints with awfully broad and familiar strokes, and my initial enthusiasm about Divine Gate being an absorbing if imperfect diversion took a big hit when I was introduced to Loki, another very loaded character name. The idea of a character who’s neither entirely good nor evil is good in theory, but the execution falls short, thanks to his really dumb clown/jester design. I don’t particularly want this joker pulling the strings. Also, a name like Loki has inescapable baggage attached to it. Like King Arthur or Leonardo da Vinci, if you’re going to use a name, you’d better do something interesting with it. Meanwhile, the refreshingly normally-dressed Akane and Midori visit Aoto again, they see he takes care of alley cats, but not all the time, only “when he feels like it”, something Akane thinks is worst than not feeding them at all. But when the hungry creature in need shifts from cats to a little boy, Akane himself can’t help but help, even if he can’t always be there to do so. 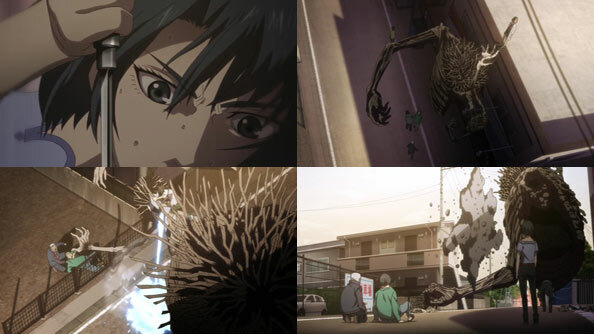 When Loki makes a police robot go berserk and the kid ends up in mortal peril, and the father is too terrified and injured to save him, Aoto has to make a choice; like the one he made on the train last week. He chooses to help Akane and Midori, who destroy the robot while he extinguishes the fire. 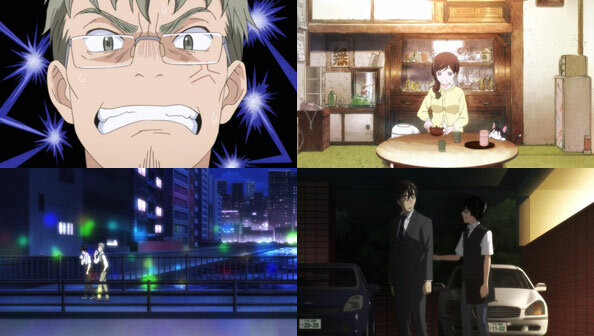 While the saved boy initially hesitates going to his inept father, and Akane curses the dad for doing nothing, Aoto can relate to consciously wanting to do something—like move forward—but being hampered by a subconscious that’s not in sync. The father’s fear overpowered his conscious desire to save his boy. I know all this because a little boy with white hair and red eyes in Aoto’s subconscious tells him and us, which is a bit clunky, truth be told, like the clowny Loki, the very sight of whom irritates me. But he apparently staged the whole crisis to shake Aoto off the shelf, and he succeeded. 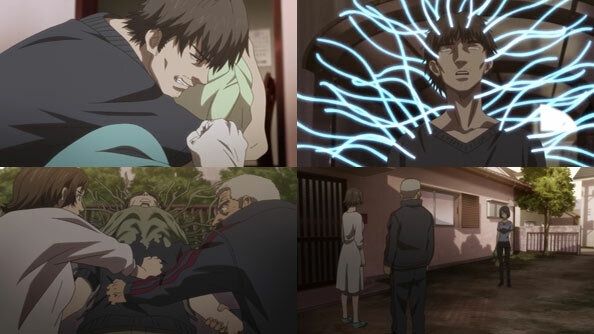 Aoto goes back to the night his parents were murdered, and we learn it was his brother, the favorite son, who actually did it. 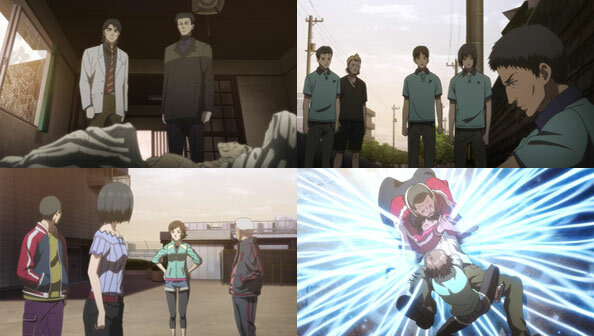 When Aoto takes his hand, he briefly sees the Divine Gate, but his subconscious delivers a shock of pain to his brother, who separates their hands and walks off, never to be seen again. So Aoto isn’t the parent-killer. Yet I felt that absolving him so easily was an overly safe choice that sapped his character of darkness and complexity. 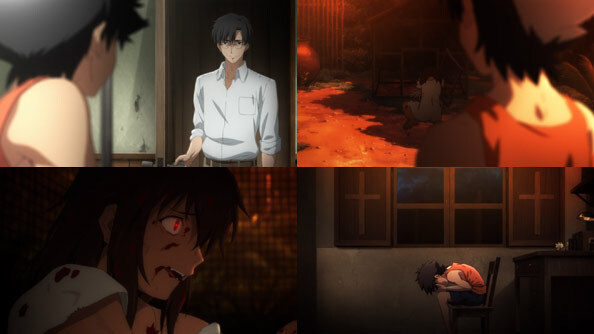 Being messed up because you killed your parents, and being messed up because your brother did, are two different things. 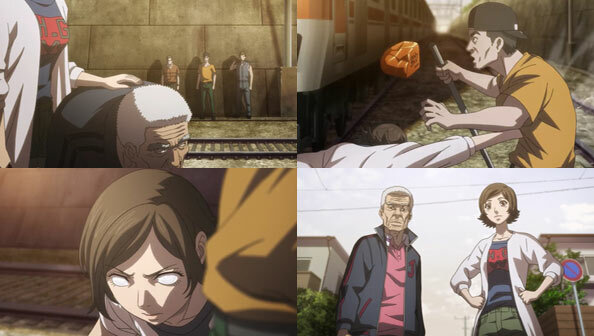 But it’s because his brother is still out there, and he wants to see him again, that Aoto joins the academy. Also, because Akane and Midori were “annoying”. Many years ago, Noriyuki Abe wasted no time drawing me into a world where a youth named after a berry, who looked like a delinquent to many around him, actually had a very kind and generous heart. 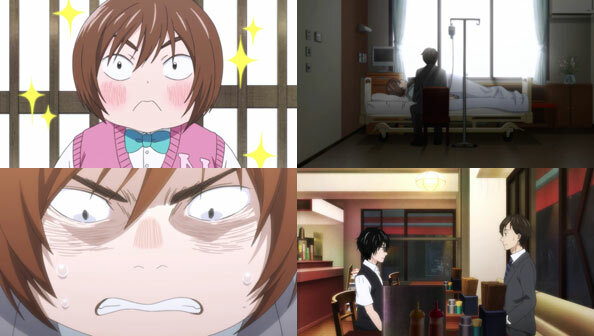 He could also see and talk to ghosts, which is how he met his first shinigami; a very cute one who sucked at drawing. I’m talking, of course, about Bleach, my first extended foray into serialized anime. There’s a lot of that same welcoming, beckoning quality coming off his latest work Divine Gate, as well as its exploration of spirituality and mythology. It’s a hard feeling to put into words, but Active Raid didn’t have it; not for me at least. Divine Gate, like Bleach, did. In DG the normal human world is just the normal human world, but there are two other worlds: a world of fairies and a world of demons. A few of those humans have elemental powers, and work under Arthur of the World Council either as full-fledged members or academy students like Akane and Midori. Even though most of Aoto’s early dialogue is internal (and quite flowery), the fact I can hear what he’s thinking is an effective way of drawing me into his world and his plight. He’s mopey and morose, but there are very good reasons for it. Meanwhile, since this is a show about elements and colors, his moroseness is balanced by his would-be academy mates. 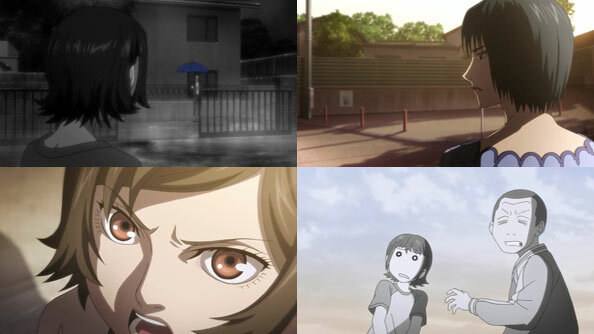 Akane outwardly mocks Midori for actually believing in the titular “Divine Gate” that will grant any wish once opened with the power of all the elements, but somewhere in the heart of every student and Council member is a desire to encounter that gate, their individual wishes ready to go. Midori and Akane meet Aoto twice, but neither encounter goes particularly well. He’s got a wall up, one they don’t—and can’t—quite understand, anymore than they understand right now how a kid could really kill his parents—which Aoto freely admits when the subject comes up (though I’m not sure he’s being truthful). 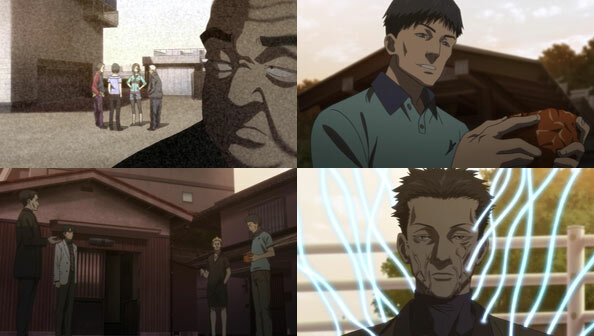 But the flashback makes it clear: Aoto was the family pariah; his parents doting on the younger son while he was exiled to a shed in the backyard eating cold food. His brother knew of his plight, but also knew Aoto had the power to do something about it, so he did nothing, instead doing whatever he wanted. So Aoto endured a thoroughly cold and loveless upbringing. Why exactly, we don’t know. The “rain” (his tears) continues to fall unendingly inside him. He doesn’t believe power can do anything, because he’s always had it and it’s never done him any good. But perhaps, with more interaction with other perspectives and elements, those inner clouds could break one day, and he’ll find that wish to be used at the Gate. DG effortlessly drew me into its world; it’s a place I wouldn’t mind coming back to next week. Not sure about the show’s logo, though. Tilted Impact? Really?